Charles and Donna Cooley of Cedar City, Utah, are the inspiration behind The Happy Factory, which has donated more than 1,400,000 wooden toys to children all around the world since its inception in 1995. The Cooley’s initial effort was to make handmade wooden toys to give to local children in distress. Through the years their effort has grown into an all-volunteer production team that has extended into more than 180 countries throughout the world. Most of these toys are distributed in hospitals where children suffer from disease and injury. Recently the toys have been finding their way to children in local communities in Iraq and Afghanistan with the help of U.S. military members. 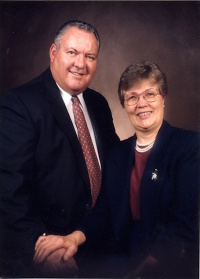 Charles and Donna Cooley retired from Southern Utah University (SUU) in 1995 where Donna was the head cashier and Charles ran the sports and cultural arena. Charles started creating small animal cutouts, which Donna hand painted. With a stockpile, Charles asked Donna if he could bring several hundred extra toys along when she next visited the Primary Children’s Medical Center in Salt Lake City. The children enduring lengthy hospitalization due to cancer and burns loved the toys. Charles said, “We got more hugs there than we did at a family reunion,” so he and Donna made more toys and delivered them each month. The smiling faces of the children was the inspiration for the nonprofit’s name of The Happy Factory. Charles also began creating small cars and trucks. On one of their trips to Salt Lake City, the Cooleys stopped into the Shriner’s Children Hospital with a box of toys. They learned that Shriner’s had access to commercially produced toys, but the hospital needed wood items that would help their young patients with bone, muscle, and joint problems. So following plans the hospital gave him, Charles began making wedge boards that assist children to stretch and strengthen tight or weak muscles, transfer boards that allowed children with muscular dystrophy to be moved from a wheelchair to a bed without needing someone to physically lift them, and a wooden tray/easel combination that allowed a child confined to a wheelchair with cerebral palsy and spastic paralysis to write without the pain of bending forward. The Happy Factory became the source of wooden items that were either not available or too expensive to purchase. The Cooley’s Happy Factory project went worldwide after they donated some toys to the LDS Humanitarian Services, which distributes aid as part of relief efforts following natural disasters. Neighbors and strangers began to volunteer to help the Cooleys. Whenever they needed resources, somehow they were provided. In early 1999, Charles met David Grant, the president of the Cedar City-based Metalcraft Technologies that manufactures custom sheet work for the aerospace industry. After touring the tiny shed where Charles and two other workers could cut out toys, David went to his board of directors and they donated $5,000 and offered to space in their large manufacturing building to The Happy Factory. Metalcraft refitted an entire section with the appropriate wiring and exhaust systems so that the Cooley’s operation could expand. With the help of hundreds of people, from high school students to retired seniors, the Happy Factory was sending wooden toys to distressed children in hospitals, family shelters, medical clinics, orphanages, and areas struck by natural disasters. When The Happy Factory wanted to start delivering toys to children in Iraq and Afghanistan, members of the military serving there were the ones to hand deliver each toy. Often family members pick up the toys and send them to their soldier for redistribution. There is no way to track how many toys have found their way to Iraq and Afghanistan, but often the Cooleys received emails and letters that encouraged them to continue. Charles Cooley passed away in 2011, having spent his retirement years serving others. Donna continues to devote time to The Happy Factory, although it now operates under Douglas Carr, a retired engineer. The factory produces more than 4,000 toys per week with the help of hundreds of volunteers. The wood is largely donated from a local cabinet maker, but there are a few expenses for wheels and axles, saw blades, building maintenance costs and other miscellaneous items, making each toy cost about 50 cents each. The Cooleys are members of The Church of Jesus Christ of Latter-day Saints. This page was last edited on 10 October 2017, at 20:11.